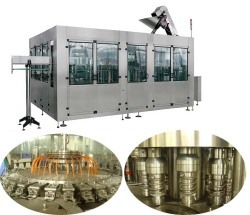 This CGF Wash-filling-capping 3-in-1unit:Beverage Machinery is used to produce polyester bottled mineral water, purified water, alcoholic beverage machinery and other non-gas beverage machinery. The CGF Wash-filling-capping 3-in-1unit:Beverage Machinery can finish all the process such as press bottle, filling and sealing, it can reduce the materials and Outsiders touch time, improve the sanitary conditions, production capacity and economic efficiency. 6. Host adopt advanced PLC automatic control technology, the key electrical components from famous company such as Japan\'s Mitsubishi, France Schneider, OMRON.